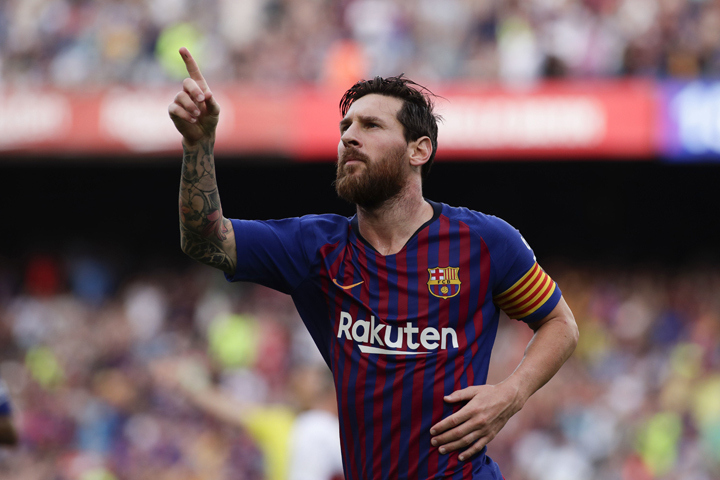 Barcelona\'s Lionel Messi celebrates scoring the opening goal during a Spanish La Liga soccer match between Barcelona and Huesca at the Camp Nou stadium in Barcelona, Spain on Sunday. Lionel Messi and Luis Suarez both scored twice as Barcelona hit eight goals past La Liga newcomers Huesca. Huesca - in their first top-flight season - lost 8-1 on their only previous trip to the Nou Camp in the Copa del Rey in 2014-15. The champions took the lead when Jorge Pulido scored an own goal from Jordi Alba's cross, and the Barca defender then set up Suarez for a goal eventually allowed by the video assistant referee. But Barca were rampant after the break with Ousmane Dembele scoring his third goal of the season from Suarez's pass. The Argentine chased on to a Philippe Coutinho ball to score his second, then played in Alba for Barca's seventh - in the week the left-back was left out of Spain's squad.